- Roundstone Lane - Between Saturday 9 and Monday 11 March a storage container was broken into and tools stolen. Serial 0765 of 12/03. - Honey Lane - On Thursday 7 March there was an attempt break to a property. Serial 0861 of 08/03. Following several complaints from residents in Angmering about mopeds being driven in an anti-social manner, over the weekend police attended as a result of calls and a moped was seized under Section 59 of the Police Reform Act. The rider has previously been issued a warning using this legislation but continued to ride anti-socially. Please report all incidents of anti-social driving/driving to Operation Crackdown. http://www.operationcrackdown.org/. - Wilkinson Close - On Sunday 16 December a motorcycle was stolen from outside the property. This was later recovered from a nearby road. Serial 1235 16/12 . - Chantryfield Road - Overnight on Sunday 25 November a garage was entered, items were moved around but nothing reported stolen. Serial 0814 of 28/11. - Pound Way - On Sunday 18 November between 2.00 pm and 7.45 am on Monday 19 November a vehicle was broken into. A college bag was searched and a Macbook Pro and wireless head phones stolen from within. Serial 0307 of 19/11. - Kinleside Way - Overnight on Sunday 18 November a vehicle was entered via unknown means and phone charger leads stolen. Serial 0363 of 19/11. - Mill Road - Overnight on Monday 19 November a wallet containing bank cards was stolen from a vehicle. Officer are continuing with their enquiries. Serial 1119 of 19/11. - Station Road - On Saturday 17 November during the evening there was a report of youths playing with fire extinguishers. Serial 1097 of 17/11. - Dappers Lane - Overnight on Tuesday 23 October the door to a caravan was forced and personal items stolen. Serial 0285 of 25/10. - Angmering - Over the week there have been 27 reports of breaks to vehicles. 11 of these occurred in Angmering in the following roads: Kinleside Way, Hazel Road, Lucksfield Way, Windmill Close, Meadowside, Chestnut Court, Ashmore Avenue, Apple Grove, Darlington Close, and Beech Way. - Ashmore Avenue - On Monday 30 July a specialised Ferrari red mountain bike was stolen from an insecure garage whilst the occupants of the property were out in the garden. - Bewley Road - Overnight on Monday 6 July a petrol mower was stolen from a property's rear garden. A Henry hoover was also stolen. Serial 0378 of 10/07. - Furzefield Close - Overnight on Saturday 7 July a vehicle was broken into; no items reported stolen. Serial 0385 of 08/07. - Dappers Lane - On Wednesday 13 June during the early hours of the morning a business was broken into; untidy search but nothing reported stolen. Serial 0109 of 13/06. - Downs Way - On Monday 19 March, a car was broken into and a locking wheel nut stolen. Serial 0169 19/3. Sussex Police have divided the County into a number of Districts. Our own, Arun District (part of West Downs Division), is divided into Neighbourhood Policing Team (NPT) areas, allowing Sussex Police to deliver a more localised service to reduce both crime and the fear of crime. The District is headed by a District Commander. Angmering comes within the "Littlehampton NPT" area. Each Neighbourhood Policing Team has a Neighbourhood Policing Sergeant who is responsible for co-ordinating the efforts of the Neighbourhood Policing Constables and Police Community Support Officers that make up the team. Date/Time - Thursday, 18th September 2015 - 6.30 for 7p.m. Angmering residents played a key role in the former Arun Neighbourhood Watch Association. 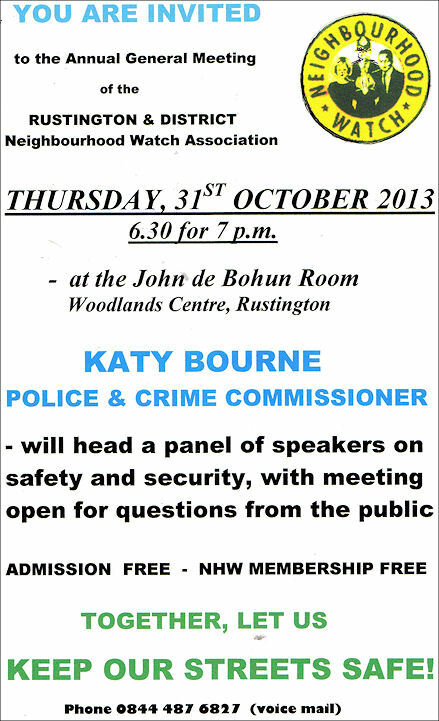 That Association ceased to function in 2012 and the Rustington & District Neighbourhood Watch Association was formed. Its inaugural meeting took place on Thursday 21 June 2012. This Association incorporates Rustington, Angmering, East Preston and Ferring Communities. A meeting was held in the Angmering Community Centre on Thursday 5th September 2013 and incorporated a very successful cycle security marking by our local Community Police. The aim of the meeting was to encourage local residents to reconnect with Neighbourhood Watch through the newly formed Association. It is considered that a smaller geographical area such as Rustington & District offers greater contact and support for residents in local Communities as opposed to the former much larger Arun Association. The Neighbourhood Watch members have often been described as 'the ears and eyes of the local Police' assisting in the prevention of crime and anti-social behaviour. Neighbourhood Watch operates through 'Street Schemes' with a volunteer Coordinator for a number of houses. The Association's Committee comprises members with considerable experience of Neighbourhood Watch activities. to improve communications between residents and the Police by encouraging members to notify their Neighbourhood Watch coordinator and/or Police of suspicious incidents; and circulate information received from the Police. through your Coordinator and/or the R&D NHW you have the opportunity to communicate with the relevant authorities. What are the powers of a PCSO? To issue fixed penalty notices for cycling on a footpath: power of a constable in uniform to give a person a fixed penalty notice under section 54 of the Road Traffic Offenders Act 1988 (fixed penalty notices) in respect of an offence under section 72 of the Highway Act 1835 (riding on a footway) committed by cycling. To issue fixed penalty notices for littering: power of an authorised officer of a litter authority to give a notice under section 88 of the Environmental Protection Act 1990 (fixed penalty notices in respect of litter). Power to issue fixed penalty notices in respect of offences under dog control orders: power of an authorised officer of a primary or secondary authority, within the meaning of section 59 of the Clean Neighbourhoods and Environment Act 2005, to give a notice under that section (fixed penalty notices in respect of offences under dog control orders). To require name and address: power to require the name and address of a person whom a PCSO has reason to believe has committed a relevant offence or a relevant licensing offence. (Relevant offences are defined under subparagraph 2(6) of Schedule 4 of the Police Reform Act 2002 and include relevant fixed penalty offences under paragraph 1 of Schedule 4, an offence under section 32(2) of the Anti-social Behaviour Act 2003 (failure to follow an instruction to disperse) and an offence which appears to have caused injury, alarm or distress to anotherperson or loss of or damage to another person’s property. A relevant licensing offence is defined as a specified offence under the Licensing Act 2003). Paragraph 1A enables chief constables to designate the power to require name and address without also designating the power of detention. To require name and address for antisocial behaviour: powerof a constable in uniform, under section 50 of the Police ReformAct 2002, to require a person whom he or she has reason to believe has been acting, or to be acting, in an antisocial manner to give his or her name and address. Subparagraph 3(2) of Schedule 4 provides the PCSO with the power to detain (under subparagraphs 2(3) to (5) of Schedule 4). However, by virtue of paragraph 2(8) of Schedule 4 the power to detain ‘has no effect unless a PCSO has been designated with the power of detention under paragraph 2 of Schedule 4’. To require name and address for road traffic offences: enables PCSOs to be designated with the power to require the name and address of a driver or pedestrian who fails to follow the directions of a community support officer or police officer under sections 35 or 37 of the Road Traffic Act 1988. To require persons drinking in designated places to surrender alcohol: requires a person whom a PCSO reasonably believes is, or has been, consuming alcohol in a designated public place or intends to do so, to not consume that alcohol and to surrender any alcohol or container for alcohol. Power to dispose of alcohol surrendered. To require persons aged under 18 to surrender alcohol: requires a person whom a PCSO reasonably suspects is aged under 18, or is or has been supplying alcohol to a person aged under 18, to surrender any alcohol in their possession and to give their name and address. Power to require such a person to surrender sealed containers of alcohol if the PCSO has reason to believe that the person is or has been consuming or intends to consume alcohol. Power to dispose of alcohol surrendered. To seize tobacco from a person aged under 16 and to dispose of that tobacco. To seize drugs and require name and address for possession of drugs: enables PCSOs to be designated with a power to seize unconcealed drugs or drugs found when searching for alcohol, tobacco or other items if the PCSO reasonably believes the person is in unlawful possession of them. The PCSO must retain the drugs until a constable gives them further instructions. If a PCSO finds drugs in a person’s possession or has reason to believe that a person is in possession of drugs and reasonably believes such possession is unlawful, the PCSO may require that person’s name and address. Power to enter and search any premises for the purposes of saving life and limb or preventing serious damage to property. To seize vehicles used to cause alarm: power to stop and seize a vehicle which a PCSO has reason to believe is being used in a manner which contravenes sections 3 or 34 of the Road Traffic Act 1988 (careless and inconsiderate driving and prohibition of off-road driving) and is causing alarm, distress or annoyance under section 59 of the Police Reform Act 2002. To stop cycles: powers of a constable in uniform to stop a cycle under section 163(2) of the Road Traffic Act 1988 when a PCSO has reason to believe that a person has committed the offence of riding on a footpath. To control traffic for purposes other than escorting a load of exceptional dimensions: powers to direct traffic (for purposes other than escorting loads of exceptional dimensions) based on the powers constables have under sections 35 and 37 of the Road Traffic Act 1988. It also gives PCSOs the power to direct traffic for the purposes of conducting a traffic survey. PCSOs designated under this paragraph must also be designated with powers under paragraph 3A of Schedule 4 to the Police Reform Act. To carry out road checks: power to carry out a road check which has been authorised by a superintendent (or a police officer of higher rank) and power to stop vehicles for the purposes of carrying out a road check. Regulation Act 1984 to place and maintain traffic signs. To enforce cordoned areas: under section 36 of the Terrorism Act 2000. To stop and search in authorised areas: powers under the Terrorism Act 2000 in authorised areas to stop and search vehicles and pedestrians when in the company and under the supervision of a constable. To issue penalty notices in respect of offences of disorder: power of a constable in uniform to give a penalty notice under Chapter 1 of Part 1 of the Criminal Justice and Police Act 2001 (fixed penalty notices in respect of offences of disorder). To issue fixed penalty notices for truancy: power of a constable to give a penalty notice under section 444A of the Education Act 1996 (penalty notice in respect of failure to secure regular attendance at school of registered pupil). To issue fixed penalty notices for excluded pupil found in a public place: power of a constable to give a penalty notice under section 105 of the Education and Inspections Act 2006 (penalty notice in respect of presence of excluded pupil in public place). To detain: power to detain a person whom a PCSO has reason to believe has committed a relevant offence who fails to comply with a requirement under paragraph 1A(3) to give name and address or who gives an answer which the PCSO reasonably suspects to be false or inaccurate, for up to 30 minutes for the arrival of a police officer (or to accompany that person to a police station if he or she elects to do so on request). Under paragraph 2(2) (as amended by Schedule 8 to the Serious Organised Crime and Police Act 2005), a PCSO may only be designated with the power to detain if they have also been designated with the power to require name and address under paragraph 1A of the Police Reform Act 2002. To deal with begging: the Serious Organised Crime and Police Act 2005 makes offences under sections 3 and 4 of the Vagrancy Act 1824 into relevant offences. It also gives PCSOs a power to detain a person whom they have required to stop committing an offence under sections 3 and 4 of the Vagrancy Act and who has failed to comply with the requirement. To enforce certain licensing offences: the Serious Organised Crime and Police Act 2005 establishes a set of relevant licensing offences. These offences are sale of alcohol to a person who is drunk, obtaining alcohol for a person who is drunk, sale of alcohol to children, purchase of alcohol by or on behalf of children, consumption of alcohol by children and sending a child to obtain alcohol. Where these offences apply specifically to clubs, they are not relevant licensing offences. PCSOs may require name and address but may not detain for those relevant licensing offences that are most likely to be committed by licence holders. To disperse groups and remove persons under 16 to their place of residence: where a designation applies this paragraph to a person, that person has within the relevant police area the powers conferred on a constable by section 35 of the Antisocial Behaviour, Crime and Policing Act 2014. To remove truants to designated premises etc. : enables a PCSO to be designated with the power of a constable under section 16(3) of (3ZA) of the Crime and Disorder Act 1998 to remove a truant or excluded pupil found in a specified area (as specified in a direction under section 16(2) of the 1998 Act) to designated premises or (in the case of a truant) to the school from which the truant is absent. To search for alcohol and tobacco: where a person has failedto comply with a requirement under paragraph 5 or 6 or has failed to allow a PCSO to seize tobacco under paragraph 7 of Schedule 4 to the Police Reform Act 2002 and a PCSO reasonably believes that the person is in possession of alcohol or tobacco, a PCSO may search them for it and dispose of anything found. It is an offence to fail to consent to be searched and PCSOs can require name and address for this offence. As specified in paragraph 3(10) of Schedule 8 to the Serious Organised Crime and Police Act 2005, a PCSO may only detain a person for failure to give an adequate name and address if he or she has been designated with powers under paragraph 2 of Schedule 4 to the Police Reform Act. Limited power to enter licensed premises: enables PCSOs to be designated with a power to enter licensed premises under section 180 of the Licensing Act 2003 for the purposes of investigating relevant licensing offences. They may not enter clubs and must enter all premises with a constable unless the premises are licensed for the sale of alcohol off the premises. To stop vehicles for testing: powers of a constable in uniform to stop vehicles for the purposes of testing under section 67 of the Road Traffic Act 1988. Power to direct traffic for the purposes of escorting abnormal loads. To issue a fixed penalty notice for cycling without lights: power of a constable to issue a fixed penalty notice for failing to comply with section 42 (lighting equipment or reflectors for cycles) of the Road Traffic Act 1988. To require a person not to consume alcohol and/or to surrender alcohol where a Public Spaces Protection Order (PSPO) is in place: designated PCSOs have the power to require a person reasonably believed to have been consuming alcohol in breach of a PSPO: 1. Not to consume alcohol or anything reasonably believed to be alcohol. 2. To surrender any alcohol or alcohol container. On-line - For non-emergency minor crime notification, this can be reported on line by using Sussex Police's web link www.sussex.police.uk/contact-us/report-online/report-a-crime/ . Mon-Fri 10:00am to 2.00pm and 3.00pm to 6.00pm. - Closed on Saturdays, Sundays and Bank Holidays.